Hey y’all, today I’m sharing a quick knitting project. Though I love sewing, machine sewing is not so portable so every time we travel, my hands need something to do. And this knit hat/cowl post has actually been almost a year in the making, stemming from our trip to Denver last January. 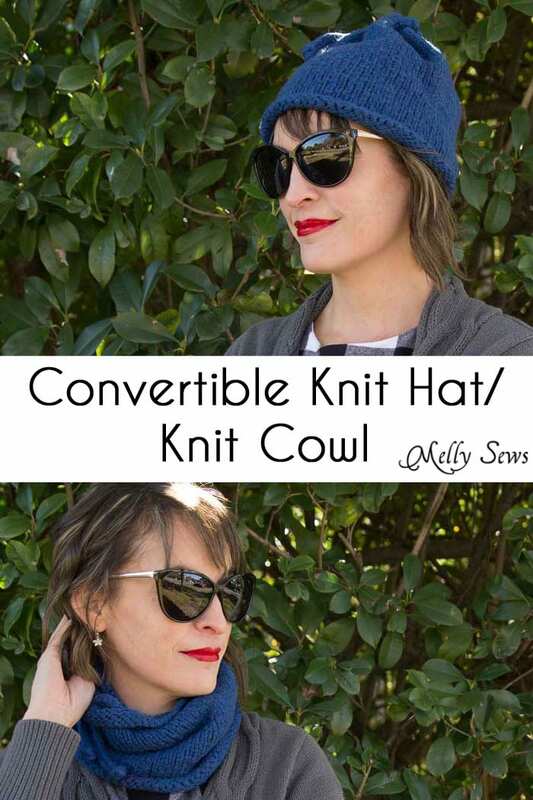 And here’s how you can switch it from a hat to a cowl and back. Note: I made these for my kids, however since they have drawstrings that exceed the length allowed by CPSC safety regulations, I am only sharing the adult version of this. If you’d like to adapt for kids, I suggest using the measurements in this post to help you determine number of stitches. Total number of stitches should be divisible by 6 and result in an even number. Gauge: 16 stitches and 22 rows = 4 inch square. I-cord – knit three stitches on a double pointed needle, then without turning the needle, pass needle back to left hand and knit all 3 stitches again. Continue until cord reaches the length needed. Next round: K3 *YO, K2tog, K3, rep from * to last 2 stitches, YO, K2. Knit 4 more rows in stockinette stitch. On the last round, knit 3, then BO stitches until there are only 3 left. Divide the last 6 stitches onto two needles. Hold one needle aside, then knit 3 stitches on the other needle into an i-cord that is the length of the hat width plus 4 inches. BO this i-cord, then repeat this process with the other 3 stitches. Knot ends of i-cords if desired. Thread the i-cords in opposite directions from each other (the point at which the cords start is center back) in and out of the YO holes until the cords reach center front. Pull the cords and tie together to make a hat, or untie and pull open to wear as a cowl. Also, for anyone interested in seeing more of my dress, here it is. 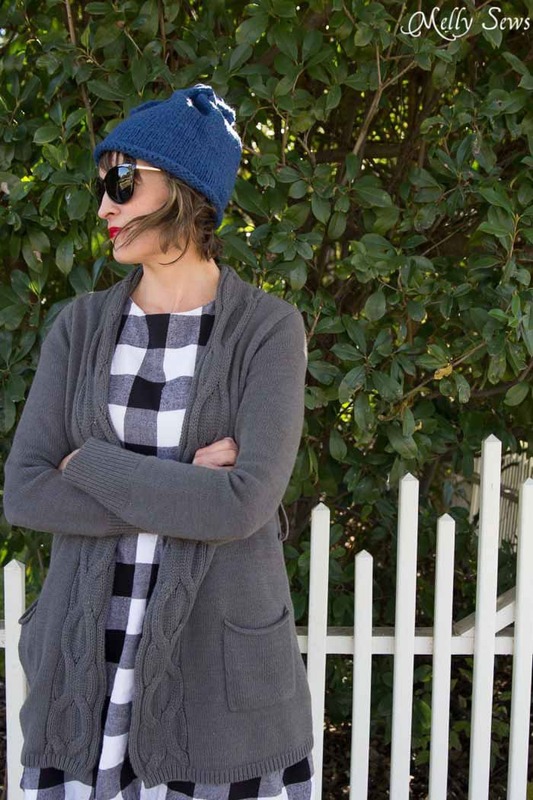 This is a hack of my Shoreline Boatneck pattern. Basically I just did the same thing I did in this hack, except I left the sleeves on and I didn’t add the darts or the zipper – the zipper isn’t needed if you don’t have darts. And as for where I got the fabric, I stumbled across this bolt at a big box store and bought it all, but it looks like they also have some in stock here (affiliate link). Love this idea!! Thanks for sharing!!! You look marvelous! Thanks for the free knit pattern. Seeing as how I finally caught the bug going around my family, everyone was sick over Thanksgiving but me. Well I am stuck in bed now and bored to tears, but you saved the day. Between coughing up a lung and running a temp I can knit a hat and scarf. Thanks Mel. Thanks for the cute beanie pattern. You can also use this for females so it could be worn with a ponytail! 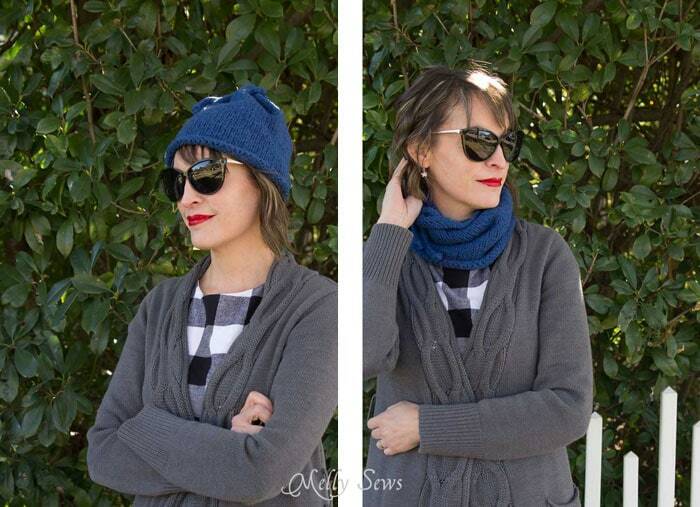 3 in 1 hat, scarf or ponytail hat. Love this idea, it looks great and looks warm!